Academies Week have published my review of the best blogs of the week. A deputy headteacher in a primary school describes lesson observations in which no grades are given. While some teachers still want to be graded, he notes several advantages to observing without giving grades. It’s a bad habit of bloggers to assume that everyone who reads their blog also follows them on Twitter and is aware of everything that goes on there. I may have fallen into that trap with my Witch-hunt post, although I’m hoping it made some points that were relevant to the education debate in general rather than just the world of education Twitter. Anyway, for the benefit of those of you who don’t follow me on Twitter, I will provide here a list of things you may have missed me (or others, but mainly me) going on about. 1) I was interviewed by Carl Hendrick after the Battle Of Ideas Conference. You can listen to that interview here. 2) I have been compiling and promoting a spreadsheet of education bloggers. If you are a blogger ,can you, please, add your details? Or if you just know how to use a spreadsheet and have some time to spare, please chip in. The full explanation and how to contribute are here. 3) Okay, I have already blogged about this, but I think it may take many reminders before it reaches even a fraction of the people affected. If you would have attended the Wellington Festival of Education at the weekend, and wish it hadn’t moved to two weekdays, can you sign the petition here, please? Thank you all. And there’ll be a proper blogpost next time. 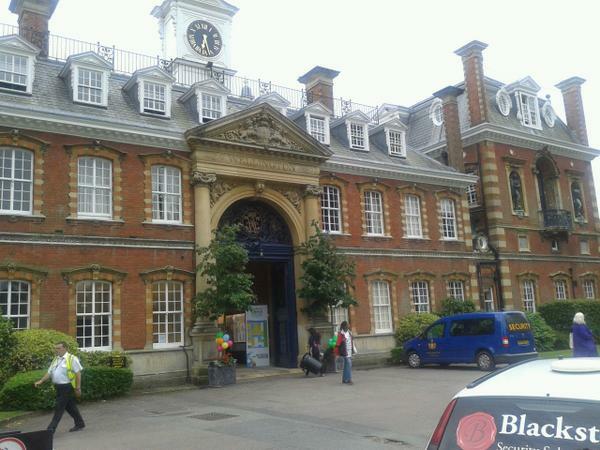 I had a bit of a disappointment yesterday, my personal highlight of the education event calendar, the Sunday Times Festival of Education at Wellington College (above), will be on a Thursday and Friday next year. While I might be able to get some time off work for the Friday, that is not certain, and what is certain is that the Thursday is completely impractical. If you are familiar with the event, it is on a scale far beyond any of the other events I go to. The number of speakers, the amount of variety and the two day length puts it on a level above anything else. It’s also a place where I first met so many of the bloggers who are now good friends. The event is expensive (it is very good value for money, but it is still a lot if paid by an individual not a school or company), down south, and at an independent school where many teachers work on Saturdays anyway. Perhaps it is inevitable that teachers (and others) who find it difficult to take time off work are not the first priority when it comes to organising it. It seems unlikely it could ever function without the sponsorship, exhibitors, attendees who work in education while not teaching significant timetables (if at all) or, for that matter, schools who send all staff as INSET. However, as somebody who went there as a teacher, and spent the majority of their time there with other teachers and listening to other teachers speak, it does feel like a real loss. This alone wouldn’t have led to a blog if some kind soul (or agent provocateur) hadn’t made the organisers aware of my discontent and the point came up that teachers won’t give up their Saturdays. Firstly, while I’m not expecting anything to change, I would be grateful if anyone who would happily give up their Saturday, for something as good as the Wellington Festival, did let the world know. There is a petition here that you can sign using Twitter of Facebook. I’m not planning to beat the organisers around the head with it, even if it does get lots of names, because ultimately it is their decision and their priorities that count, but they should know if lots of people feel this way. Secondly, I did want to address the claim that teachers won’t give up Saturdays more generally, as I’ve heard it made in cases that are far less understandable than this. The argument goes that teachers value their weekends greatly. This is true. They also try to avoid taking work home with them at weekends. This is also true as long as the emphasis is on “try”; I doubt many full-time teachers manage it. Therefore, they won’t do anything education-related at weekend, and would prefer to do it during the week instead of being in school. This is far less true. If you teach classes you often want to minimise your time away from them for their sake. I kept returning to work, on and off, during a family bereavement because I simply couldn’t let an exam class go without me. In fact, if you don’t feel that way it’s often time to leave. I left one school not long after I realised that jury service was more fulfilling than teaching there. Additionally, there are limits to what time away you can get, even if it is classed as CPD. I cannot imagine asking for two days off in any week in any school, and one day can be a bit hit and miss. I have in the past gone years without going on any kind of course. It’s often about power and influence, and only those with lots of one or the other, or both, get away from work in the week. Any event that finds teachers can attend in the week is not getting the frontline, they are getting managers at best, and consultants and other non-teachers at worst. Perhaps this is often the issue. There are too many groups whose main contact with the teaching profession is with managers and consultants, not those with a full teaching load. Which is why we should consider what the exceptions can show us. I’ve seen or heard the people behind both ResearchED and the La Salle Maths Conference, say they have been told that they will have problems attracting teachers to events on Saturdays. This has repeatedly been shown to be wrong. The ResearchED conference on a Saturday in September attracted over 700 people with hundreds more left on the waiting list. La Salle Maths had something like 500 at their September event (which covered one subject and was in Kettering) and is expecting 800 at their next. Both events have seemed to be overwhelmingly full of teachers. If you build it, they will come. It just takes a willingness to try. I’d also love to see what happens if people try organising events in the school holidays. Perhaps it won’t work, perhaps people don’t want to think of work, but if I can get 30 bloggers to meet up for a drink and a curry in the holidays and talk about education, I can’t imagine that the holidays are a complete write-off. The more serious side to this is when groups who claim to represent the opinions of teachers hold their events during the working week. Subject associations that hold their AGMs or main conferences on a weekday should be utterly ignored in policy-making. They simply don’t speak for teachers and sometimes (I speak here as a maths teacher) it is very obvious how out of touch they are. And, I’m sure I mentioned this before, I lost all interest in the idea of a (Royal) College of Teaching when an event to mark the start of the process of launching one took place on a weekday and I saw Twitter fill with comments from (and about) consultants, trade union leaders and a handful of senior managers. Teachers are people who work in the week to quite a tight timetable. This should be the first fact anyone considers when doing anything that is intended to engage teachers. There was a bit of a fuss over the last few weeks on education Twitter. It consisted of large groups of Twitterers simultaneously denouncing a series of targets in ever more intemperate ways. It began with Uncommon Schools being criticised for their training videos which showed children being trained to follow a routine in class. Then I was criticised for having argued with people on Twitter. Then Rob Peal was criticised for this brilliant book review. Then I was criticised for having argued with people on Twitter. Then John Blake was in the firing line for minor acts of snarkiness and the suspicion of being posh. Then me again, this time for being a man who argued with people on Twitter. Then a maths teacher, with a couple of hundred followers, was targeted for the crime of not liking some maths homework she’d seen. Then it was me again for denying that I was privately educated (don’t ask). Eventually, the mob started to turn on itself and people were throwing abuse at the some of the most non-confrontational people on Twitter. Then, with a couple of people quitting Twitter, it all seemed to die out. I don’t know if anyone has learnt anything from the saga. In terms of Twitter, I am going to be very careful to make sure that, when I criticise something, I stay around to make sure the people who agree with me don’t act the same way as that mob. I’m also going to be careful what I share about my own life on Twitter, and to add more smilies when I make jokes about how great I am, as the mob seemed to make great use of of both unhappy times in my life I’ve talked about honestly, and my arrogant persona. However, it did lead me to reflect on the conduct of educational debate again. The witch-hunt analogy appeared very early on when describing the public denunciations – I went on to label the whole business as “the Twitch-hunt” – which reminded of some of the arguments over Trojan Horse which was described as a witch-hunt by some of those accused. Because education has been dominated by a fairly narrow orthodoxy, it is easy to paint opposing views as heretical. One recent lead article in an education journal talked of “mainstream educational thought” being challenged by “blogocrats”, as if voices from the staffroom becoming heard on social media were an unwelcome contaminant to a debate which should only ever take place between office-dwelling experts. But considering that even opinions that were once beyond the pale can quickly become the accepted wisdom in the social media age, how do we ensure debate does not become a witch-hunt against dissent and difference? I think there are three key distinctions between a debate and a witch-hunt. The first is that for a debate it must be possible to answer criticisms. If twenty people have a go at one person, then debate becomes difficult. I’m good at arguing with a lot of people at once, but even I struggle to keep up with answering the comments on my blog. This can become self-reinforcing if those who disagree, having got the false impression that they speak for only a tiny minority, keep their opinions to themselves. Don’t argue against people’s ideas behind their backs, or for that matter, in the third person when they are still part of the discussion. Right to reply should not only be a given, it should be encouraged. If criticism is vague or highly subjective then it is hard to argue against it; a lot of the criticism of Uncommon Schools consisted of little more than people saying “I don’t like the look of that”. Don’t introduce notions of politeness that, if taken seriously, would end debate. Polite disagreement is not a contradiction in terms, but if there is a conflict between civility and debate, let’s favour debate. Similarly, complaints about “tone” are unhelpful when we all naturally imagine all sorts of things about our own tone and the tone of those who disagree with us. If criticisms seem arbitrary, they can be very hard to answer. Certainly a lot of the flak aimed at me was for doing things (like arguing) that others had no problem with when people they agreed with were doing it. This also reminds me of a “Trojan Horse” school being criticised for something that, while questionable, was praised a few months earlier. As far as possible, we should criticise others on matters of principle only after we have set out the basic principles we expect all to follow, defended those principles in debate, and tried to live by them ourselves. A further complication is if those making the criticisms are doing so from a position of unchallenged power, then debate is more difficult. I do think “unchallenged” is important here. Politicians have power over education, but nobody thinks twice about arguing against what they say. Arguing with your own SLT, or, if you are a school leader, criticising OFSTED can be far more scary. Anything endorsed by the inspectorate is very difficult to argue with, as schools and teachers have found to their cost. I don’t think anything did more to suppress open debate than the period between 2004 and 2012 when OFSTED became the official enforcer of progressive education. And it is simply not good enough for people who are not without power and influence to paint themselves as the victims, or to appeal for pity in order to strengthen one’s debating position. One protagonist in the Twitch-hunt decided to share the fact they were a victim of child abuse, while condemning others for expressing their opinions. How could that ever be relevant? Another proved that those they disagreed with represented “the establishment” by observing that some of them were white, male and straight. It can be difficult to establish who does or does not have power, but these sorts of arguments do not help. Those of us who feel pretty powerless in real-life, but have a significant following on social media, should be aware that we may have power of sorts, although those complaining of “loud voices” on Twitter need to state their complaint in less metaphorical terms. In addition to the openness of debate, the second distinction between debate and a witch-hunt is the personal nature. We need to be quite clear that criticising somebody’s publicly expressed opinions, or their public behaviour, is acceptable. Criticising their character, even when it is revealed by those opinions and actions, is not. There is a lot of confusion about this. Sometimes legitimate criticism is taken to be personal. For some, their educational ideas are so personal that they are insulted to hear them challenged. For others, their sense of self-worth is so bound up in their teaching practices, that to have those practices challenged is to be told that they are worthless. This is unfortunate, but should not be allowed to stop those debates. Ideas and practices must be challenged, it is only by refuting such challenges that they can be established to have any worth. In particular, people who claim things that are untrue, whether through deliberate deceitfulness, indifference to truth or simply through error, should be challenged. If it is clear they knew what they were saying was not true then it is acceptable, and not an insult, to say that they lied. Similarly, true but misleading claims, must be challenged openly and explicitly. And it is no defence to appeal to one’s personal feelings when one is wrong in a matter of fact or reasoning. If you feel bullied when people point out you are wrong, then you need to put more effort into avoiding being wrong and learn from those mistakes, not demonise those who point it out. As well as being able to take criticism of ideas and behaviour as not being personal, it is also important to refrain from personal criticism when attempting to criticise ideas and behaviour. Don’t call somebody with stupid ideas “stupid”. Don’t even call a person caught lying “a liar” if you can avoid it (although if they say “are you calling me a liar?” then so be it). If the same behaviour can be described in words with a stronger or weaker implication about the the person doing it, then pick the less personal option. Never use an ad hominem argument, i.e. one that rejects an opinion or argument on the basis of who made it. Do not refer to somebody’s race, class or gender in debate if they do not bring it up. Do not make everything that happens in a debate about you personally. Don’t put anyone in a position where disagreeing with you entails making a claim about themselves, or a claim about you. We should mainly be debating ideas. Sometimes we have to debate how to debate, but we should avoid debating people. Finally, the third feature of a witch-hunt, is that unlike a debate, you can’t easily drop out of it. Even when you block those doing it, they still attempt to engage with you. Even when you ignore their accusations, they are guaranteed to be repeated to you. Even when you have proved somebody to be wrong, you are faced with an ongoing discussion about how, despite them being wrong and you being right, you are still at fault. It can only end with them giving up, or you being completely silenced or completely excluded. In the school context, it may be a situation where a person with the wrong opinion will have to leave. People can leave the debate freely i.e. without significant cost. The creation of specialist teaching schools was intended to move power from those ideologically motivated individuals in local authorities and universities, who followed every fad and fashion, to those in schools with a proven track record of success. Unfortunately the policy depended on the ability of OFSTED to recognise excellence in schools and the willingness of schools to be confident that they can retain outstanding status without second guessing OFSTED. The following blog, written by a teacher in a teaching school that’s overdue for inspection, suggests that this may not be working out as planned. Principle vs Principal (or when scrutiny becomes lunacy). Somewhere in the leafy depths of suburbia there is the a monster. It’s called an Outstanding Teaching School. This creature is large and cumbersome, years of tradition and rigidity have made it old before its time. It’s sleeps through behaviour for learning dramas, A*- C % nightmares, Ebacc uptake worries and smiles sagely as fellow critters scurry to increase amounts of written work in books, create whole school inclusion policies, or you know, even improve results. The monster has been left alone, existing on the fat stored over a hundred years, for what can be done to create a more glorious and wonderful being? In fact, like a Biblical idol, all should look upon it in awe, grateful for its very prescence. It needs no one. Loves no one. It’s allegience is to itself alone. What’s that? A new predator on the horizon? What could possibly take on this Outstanding Teaching School? ‘Keeping Teaching School Status’ stalks across the savannah, a jackal waiting to take down the least agile, the weakest. It’s teeth can slash a budget by hundreds of thousands, decimating the hopes and dreams of SLTs across the country. The jackal wears a coat of Osted, slobbers edu-tainment teaching practices and demands its followers fish clouds from the ocean’s depths. Don’t worry. OTS has a plan. OTS will trick KTSS, like a chameleon, it will change its colours to match those black and white tick boxes. OTS will outsmart that KTSS putting on a pretty dress and batting its false eyelashes. No one could possibly notice the muddy feet and broken toenails with such an angelic face to behold. Some parts of OTS couldn’t squeeze themselves into the tight sleeves of this outfit. The collar fairly strangled others. The scratches and bruises left seemed like they would never recede. But OTS must outrun KTSS. It has to, to survive. The only question left to answer is – what will OTS do when principle wins out over principal? That day is getting closer. You are currently browsing the Scenes From The Battleground blog archives for November, 2014.